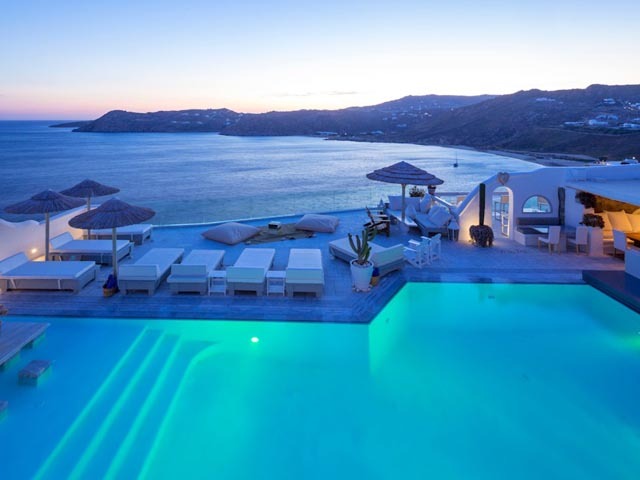 Greco Philia is a 5 star Art-Boutique hotel offering 26 luxurious Suites and Villas, each one with its uniquely different pavilion concept and design but all with breathtaking sunsets and panoramic views of the Aegean Sea, all the contemporary comforts and the finest in Mykonian Style. 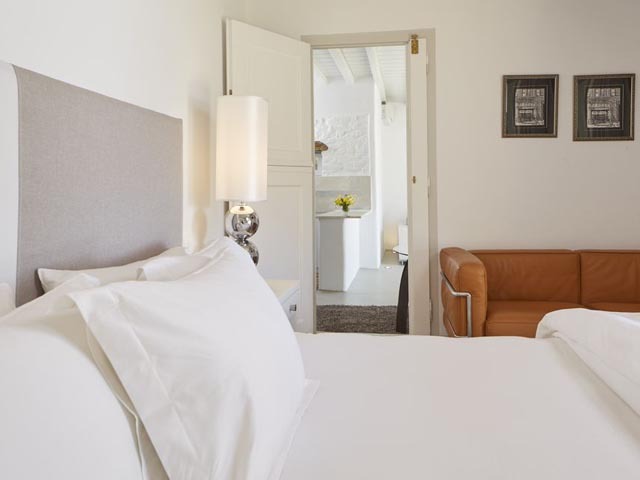 Experience a superb Mediterranean cuisine, unique spa treatments, an absolute relaxing feeling during the sleep due to the top quality bedding and mattresses. 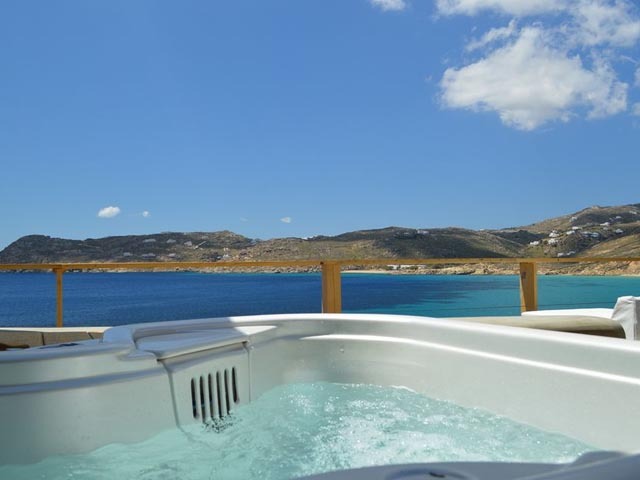 Accommodation is enhanced with the total privacy that the private outdoors Jacuzzis and pools generously offer, with welcome delicacies and a fully replenished mini bar daily. Warm and discreet hospitality for the most discerning of travelers. Meet Stergios. Each morning he casts his nets into the Aegean, as he has done for the past 25 years. Each day he delivers a fresh catch of squid, octopus and a variety of local fish to our kitchens. This passion for the freshest, local ingredients runs through all of our cooking at GrecoPhilia. We grow olives, tomatoes, arugula and greens in our sunny kitchen garden. Other produce — like local Kopanisti cheese — is bought from local family farms and delivered by boat from the tiny island of Tinos. Eat breakfast, lunch or dinner, served in breathtaking surroundings in GrecoPhilias restaurant. 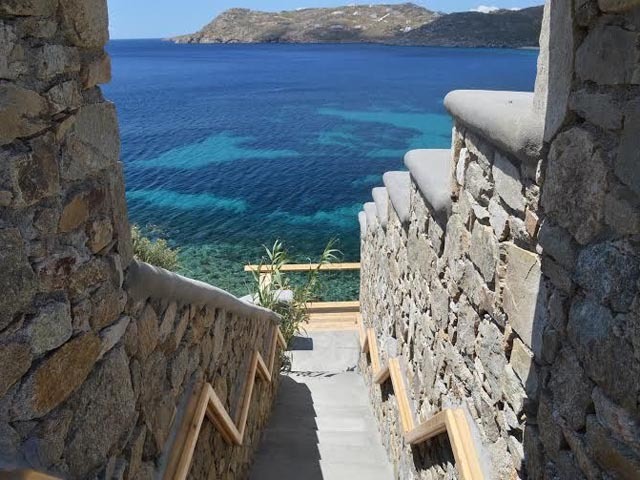 Enjoy a traditional Greek menu — homemade yogurts, bread and cakes, local fish, meat and vegetables — cooked with respect and elegance by our chef. Or order any meal to be served in the privacy and luxury of your room. After all, it’s your holiday. 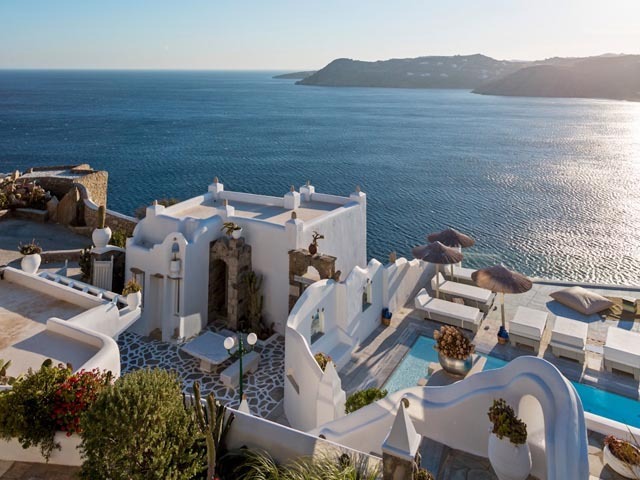 The Junior Suite Sea View offers generous views over the Aegean Sea. 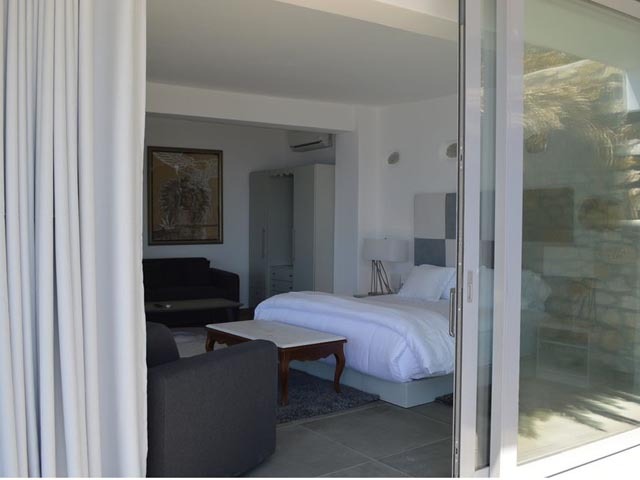 Minimal design, modern furnishing and relaxing moments in the private veranda is what the guests enjoy in privacy. Located in one the highest level of the hotel, resembles a small eagles nest. 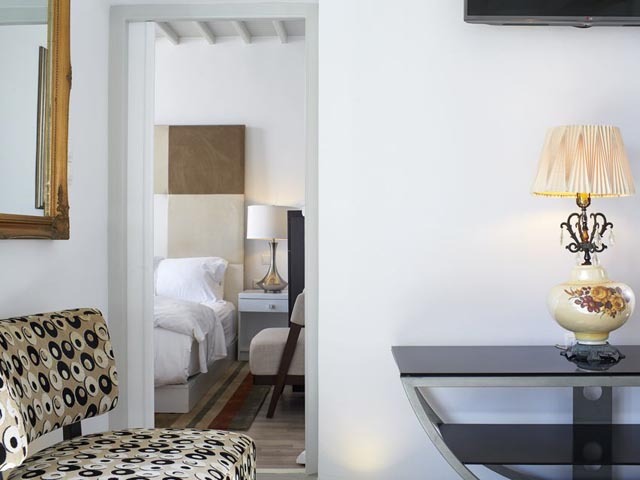 Classic Mykonian style Superior Suite and a light breezy atmosphere belie the modern luxuries within. Living area with built-in daybed and shelving looks out upon Cavo Elia from sliding glass doors. 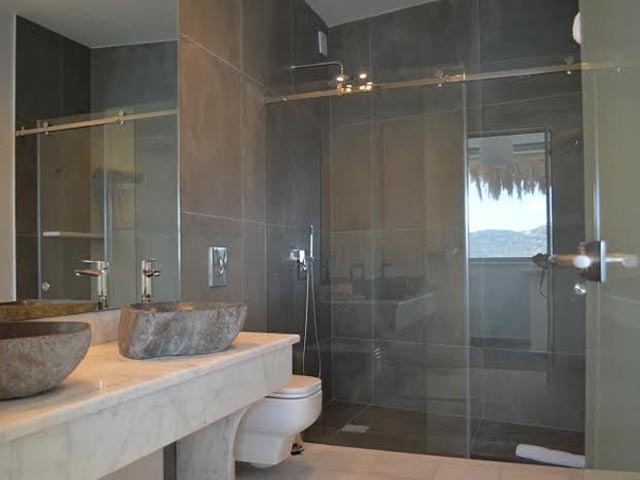 Sparkling white plaster walls lead to the large luxurious bathroom, frosted glass doors slide back to reveal enormous shower, Roman style tesserae and a separate bathtub. The bedroom features a glorious low profile queen bed with lighted headboard. For the romantic, a large fireplace and built-in shelves compliment the framed stone flooring. Generous closet space and shelves throughout complete the Suites interior. Stone archways frame a peaceful and private sheltered garden and enormous private deck with a double sun bed. 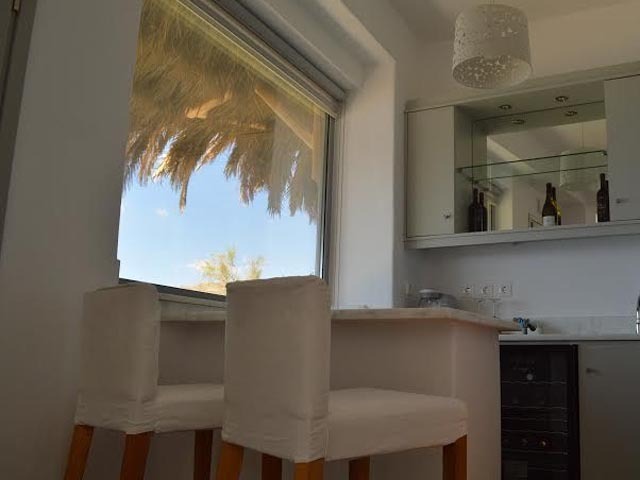 A charming Junior Villa tucked discreetly into the lower hills near the beach, the villa is the essence of simple beauty. 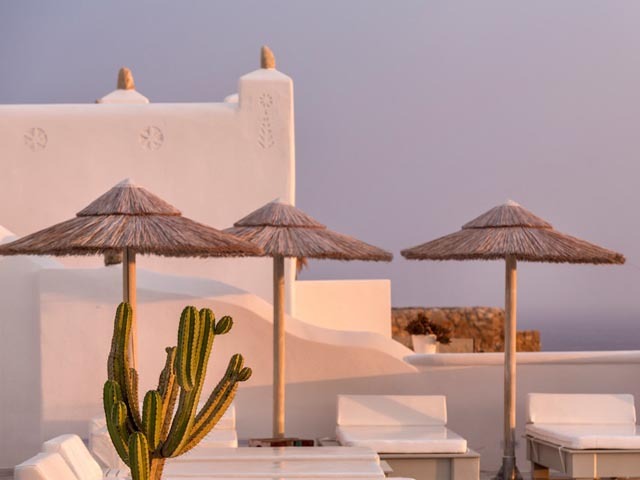 The minimalist white masonry typical of the Cyclades adorns the walls and floors of the villa, making the whole villa bright and airy. Cypress trees and blooming grape vines bracket the beautiful views of Cavo Elia and generous outdoor veranda spaces. 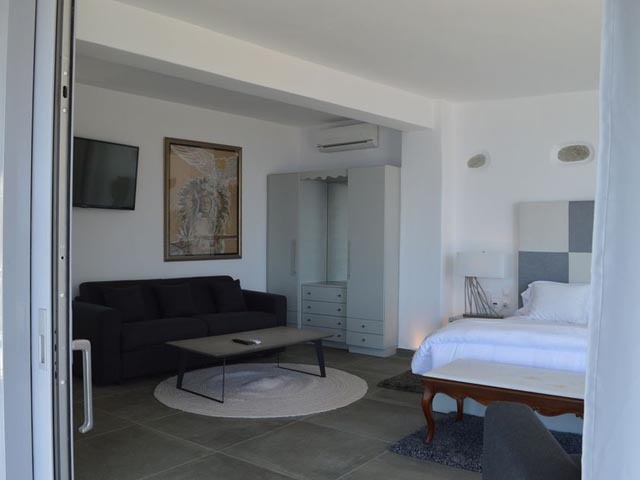 Private parking, large separate bed and living rooms and luxurious en suite bath make the villa ideal for a traveling artist or a couple enjoying their journey together. 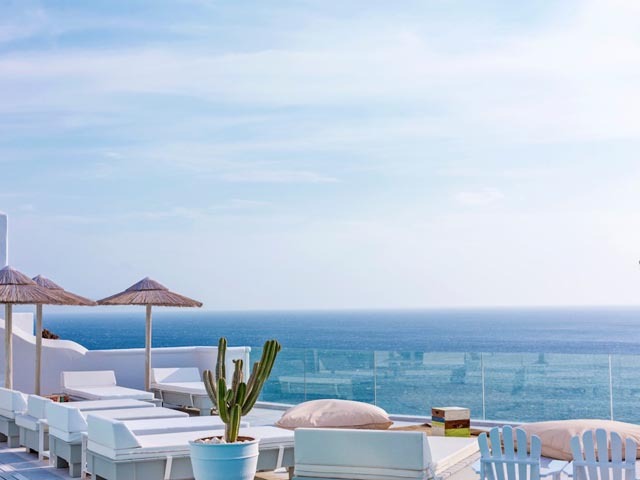 Perched high upon the cliff, the 2-levels Deluxe Suite Sea View offers sweeping views of the cliffs and sea as well as private gardens and terraces. 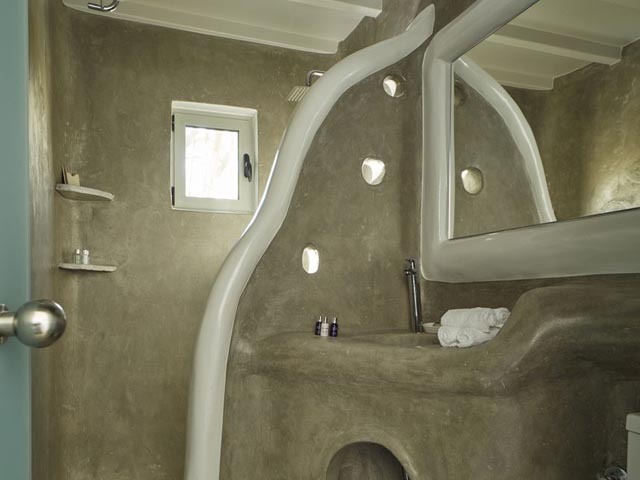 An ideal space for a couples retreat, the living room has a luxurious, custom made daybed, while the bath features a spa like marble shower and bathtub. Wake up to stunning views from the queen pillow topped bed and enjoy private veranda spaces on three sides. 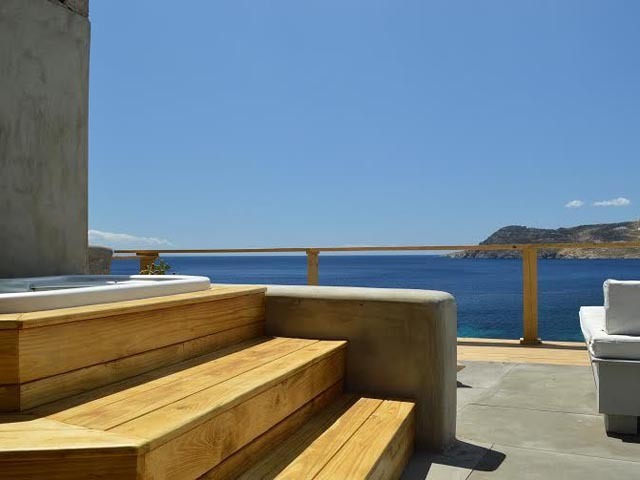 Ample spaces in a wood and stone surroundings and a private pool overlooking the Aegean Sea are the highlights of this superb Deluxe Villa Sea View. 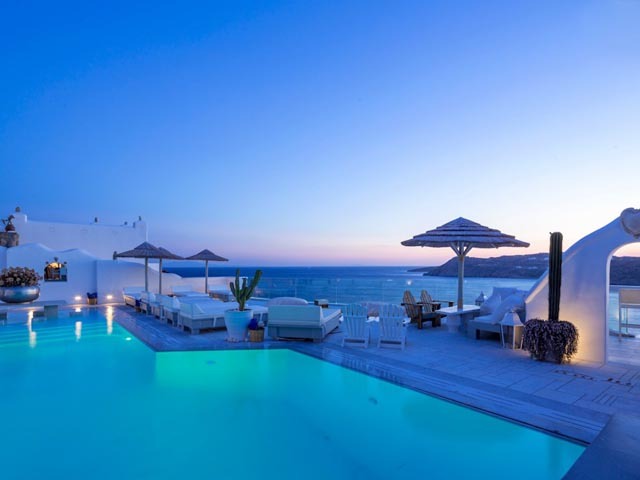 Chill out with a chilled cocktail in the pool and indulge in the stunning views of Elia beach and the islands of Paros and Naxos in the background and allow yourself to get pampered in the luxurious bathroom. An unparalleled setting for the most discerning of travelers. 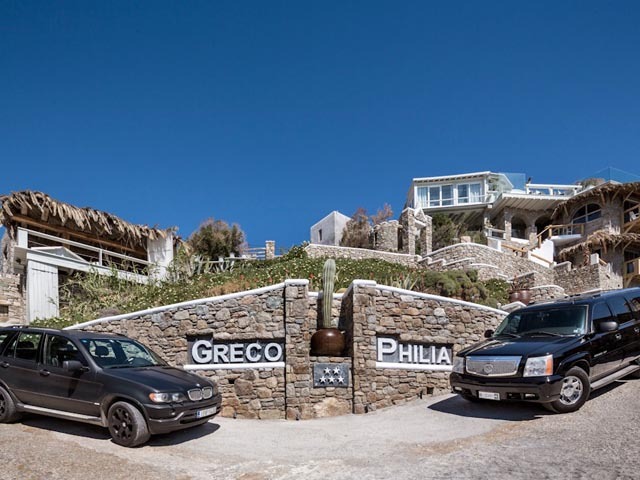 Greco Philias flagship Deluxe Villa, features two uniquely designed bedrooms and a large veranda with a private bar and patio area. 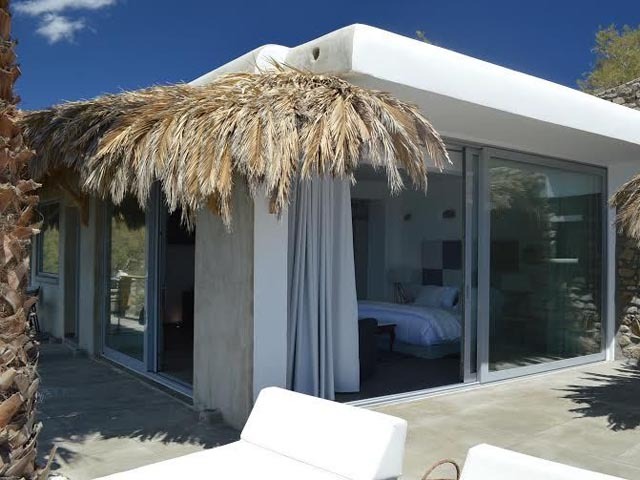 The Villa was designed to provide the ultimate in luxury, convenience and privacy for two couples traveling together. Breathtaking unobstructed views, private parking and a private entrance enhance guest privacy and independence. Each suite features a custom memory foam bed, luxurious walk in shower as well as individually controlled air conditioning unit. Both bedrooms are luxuriously appointed and feature all modern amenities. 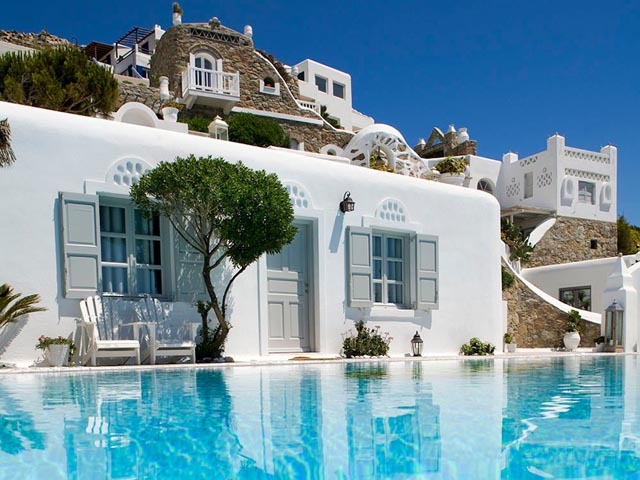 The Villa is perfect for a long-term get away, business trip or luxury family vacation. 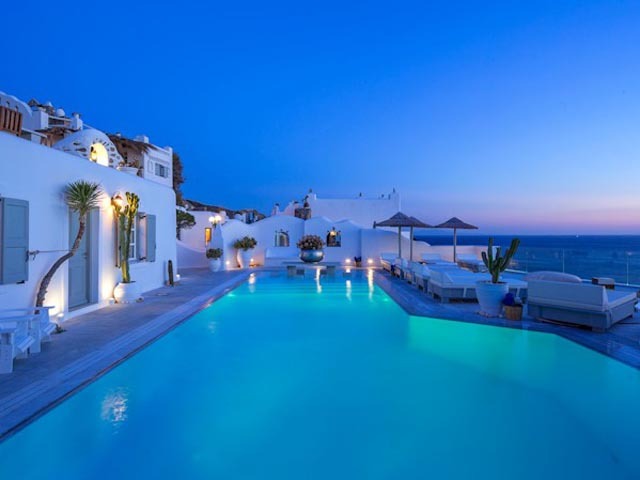 A super​ large ​VIP Villa​ with Private Pool especially designed for the most discerning of travellers. 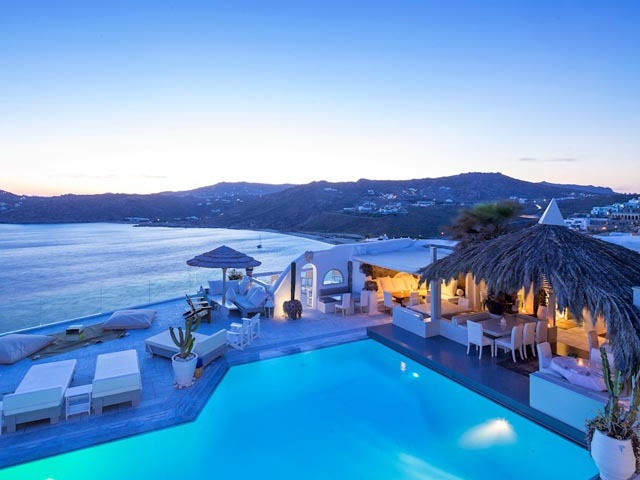 It features a private swimming pool with panoramic sea views, and an outdoor bar with dining area. Sleep peacefully​ in the ​spacious​ king size​bedroom, ​relax in the ​adjoining large living room, ​and get pampered in the luxury indoors walk-in shower and Jacuzzi. 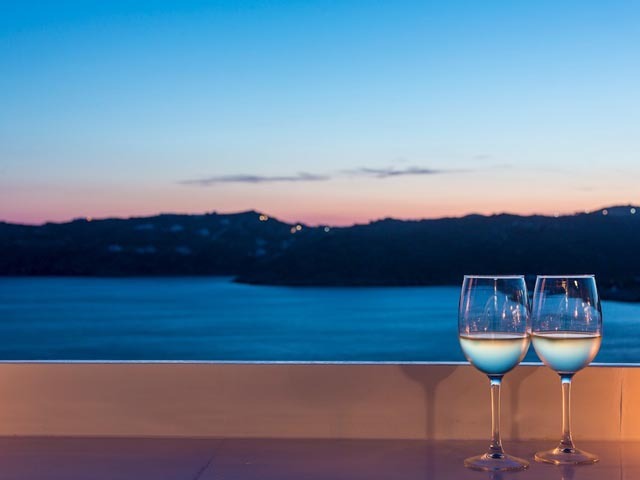 Enjoy your drink or meal all day long and night in the large panoramic private terrace with open-air dining area, bar ​and sun beds​ and chill out in your private swimming pool enjoying views to the sea ​and ​​the sunsets. Greco Philias flagship VIP Villa with private Jacuzzi, features two uniquely designed full suites linked by an enormous veranda with a private bar and outdoor ​Jacuzzi for four​. The Villa was designed to provide the ultimate in luxury, convenience and privacy for a family or two couples traveling together. Breathtaking unobstructed views, private parking and a private entrance enhance guest privacy and independence. Each suite features a custom memory foam bed, luxurious walk in shower and jacuzzi tub, as well as individually controlled air conditioning. Both suites are luxuriously appointed and feature all modern amenities. 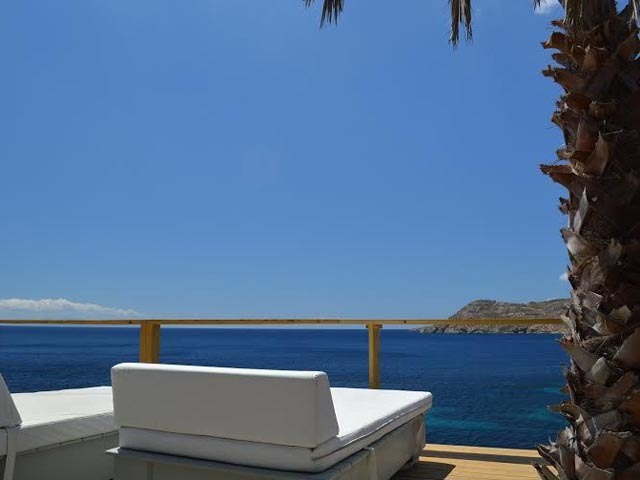 The Villa is perfect for a long term get away, business trip or luxury family vacation. 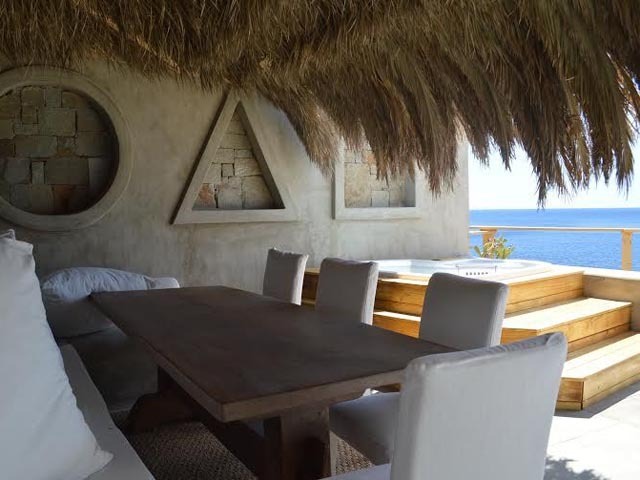 A magnificent ocean front secluded Villa with private Jacuzzi and unparelled minimal style. Open April to October... Greco Philia is a 5 star Art-Boutique hotel offering 26 luxurious Suites and Villas, each one with its uniquely different pavilion concept and design but all with breathtaking sunsets and panoramic views of the Aegean Sea, all the contemporary comforts and the finest in Mykonian Style.